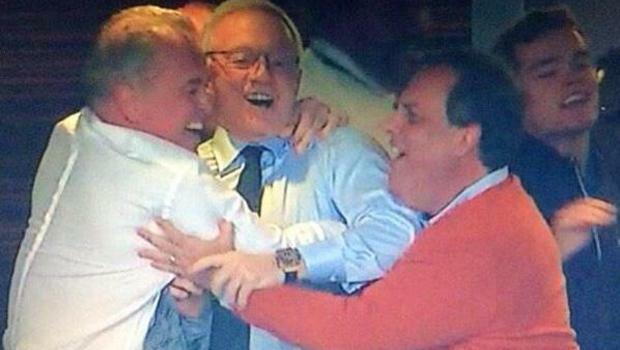 Like countless die-hard New York Giants fans, I have been outraged by Governor Chris Christie's brohugs of Dallas Cowboys owner Jerry Jones, both in Texas last week and, earlier, in Philadelphia, and I will erupt if I see Christie huddling for warmth in Jones' Lone-Star bosom this Sunday in Green Bay. A New Jersey boy pledging allegiance to the self-anointed "America's Team" is a traitorous act, like hanging Kate Upton's Sports Illustrated swimsuit over your wife's dresser. It just isn't done. But I'll say this about Christie's owner's-box PDA: When it comes to football fandom, he is a man of his convictions, however low they may be. Christie and I are North Jersey natives produced of the same vintage -- he, Livingston High School '80; me, Boonton High School '80. We both became football fans in the early '70s, with Christie going for winning anywhere over regional or generational loyalty or popular consensus. When I was absorbing the local sting of defeat in the era of Rocky Thompson and Paterson Plank Joe Pisarcik, young Chris was celebrating the Super Bowl triumphs of Tom Landry's teams, painting his room silver-and-blue no matter that the colors belonged to one of the Giants' fiercest rivals in a state far from his own. However, in this, he was not alone. Among my neighborhood pals, though the largest number rooted for the lousy Giants or some for the vestiges of Broadway Joe's Jets, a small but visibly-offensive minority wore the Miami Dolphins' turquoise and orange, the Pittsburgh Steelers' black and gold, the Oakland Raiders' silver and black, even the Minnesota Vikings' purple and white. They were friends, but their front-running support for others cities' teams made them morally suspect. Their fandom was made as a temporal choice -- if they'd been born a decade earlier, they'd have worn the Green Bay Packers' green and gold -- rather than by the condition of eternal obligation, as imbedded in our identity as our local accent. Would their affection for these distant top-of-the-standings teams survive the ultimate test of fandom -- losing? Doubtful. Fundamentally, it was a question of character. Who would you rather have beside you in the proverbial foxhole: a guy with "Cubs" tattooed above his heart or one with a picture of Kate Upton in his pocket? According to Christie, his love the Cowboys has never wavered, even when political ambition or regional conformity would have made things easier, when my Giants were winning four Super Bowls and dominating North Jersey culture, while Dallas suffered with a decade of terrible or tumultuous teams. Clint Stoerner, anyone? Some of my old gang also hung with the Cowboys through those years, but I haven't seen any of them wearing Vikings' jerseys since Fran Tarkenton's last scramble. If it's true that the Governor of New Jersey has rooted against the hometown Giants and Jets (and we'll throw in the South Jersey-supporting Philadelphia Eagles), then, remarkably, he is a rarity among politicians. For remaining fixed to his Cowboys, Christie's moral compass is truer than Hillary Clinton's, a supposed Cubs lifer who shamelessly wore a New York Yankees cap during her New York senate campaigns, or Michael Bloomberg, who abandoned his beloved Red Sox for the New York teams when it suited the photograph. (Barack Obama gets a pass for adopting the Chicago Bulls as his own since there were no pro teams in Hawaii or Indonesia.) Only Rudy Giuliani's wearing of a Yankees cap in Shea Stadium during the 2001 World Series may qualify as a more politically courageous act than Christie's Cowboys love-ins. So, paradoxical as it may seem, if there were room for both of us to fit, wouldn't I rather have someone like Christie with me in that foxhole? Still, there's the unavoidably disturbing matter of him choosing a team from away, and from Dallas, of all places. What does that act of rejecting his birthright say about the man? Surprisingly, the young Christie may have been a trendsetter, or at least an early member of a movement. You cannot enter an artisanal pub in Brooklyn, or a cocktail party in Manhattan, or -- shockingly -- my own two sons' bedroom, without being assaulted by the jerseys, colors and logos of English Premier League football clubs, or those from Spain, Italy and France. For Christmas, my younger son requested a Paris St. Germain Football Club jersey. He wouldn't know a Camembert from a Roquefort, but, this season anyway, he roots for a team from Paris. He alternates wearing the rouge, blanc et blue with a Odell Beckham Jr. Giants jersey, clearly unphased by the moral conflict that would have overwhelmed me at his age, to say nothing of his grandmother, whose young heart was so shattered by the Dodgers' desertion from Brooklyn that she has never rooted for another team. It's a different world. Chalk it up to the disloyalty of vagabond sports teams and their athletes for whom the ultimate allegiance is financial; or the prolific marketing of teams beyond their geographic borders; or the explosion of televised sports from all over the world; or just the shifting mores that come with generational change; but there is no denying that rooting for the team of your choice rather than the one of your birth is the new reality, a symbol of our age. I never thought I'd say it, but despite looking like a stuffed potato in a Cowboys aluminum foil jacket, Chris Christie is not only a man of principal, he's a man of our time. And who could criticize that. Go Packers!